"Enjoy these meatballs in a wonderfully tangy sauce! Use your favorite flavor of barbecue sauce. 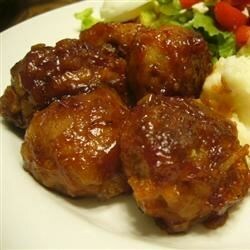 When the meatballs are done, you can place them in a slow cooker/server to keep them warm." This is an old standard. It is super easy and not really much to it. Use a good quality barbecue sauce though. I made half a recipe and added pasta sauce. Pretty good.